A commentary on Jamgon Kongtrul Lodro Thaye's Treasury of Knowledge. 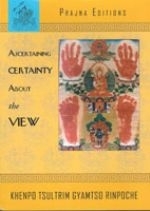 Ascertaining Certainty About the View is explained from the perspective of the different Buddhist schools. The author includes Jamgon Kongtrul's root verses of the text and his commentary along with several songs by Khenpo Tsultrim and Milarepa. Khenpo Tsultrim Gyamtso provides a detailed line by line commentary by Khenpo Tsultrim on the seventh chapter of the third section of Jamgon Kongtrul Lodro Thaye's Treasury of Knowledge which covers seven points on gaining certainty of the correct view.